A stunning medieval castle and a tale of ghosts . . .
Frangokastello looks very much today as it did when it was built in 1371. In this area of south western Crete live a race of people called the Sphakiots. They are strong and brave and fear no man. They can be a severe problem to people who come to conquer them, as did the Venetians. So the castle was built here by the sea on a small plain under the White Mountains of Sphakia. Then . . . well, nothing happened. The Venetian soldiers stayed in and around the castle and the Sphakiots stayed clear of them. But let us get on to the ghosts that still appear here, it is said. They are called the Drosoulites, the men of the dew, in English. The legend tells us that they appear on just one day a year at early dawn. A day in late May when it is damp and windless, they walk in single file through the castle and down into the sea. I have spoken to people who say that they have seen them, but they have never been photographed. Some say that they are the hallowed ghosts of the men of Hadzi Michalis Dalianis who stood here in the castle with his 600 men in 1878 against the Turks. Eight thousand turkish soldiers were sent to deal with them. Others say that the ghosts are simply a mirage of Libyan soldiers from across the Mediterannean, but nobody really knows. However Frangokastello keeps on being one of the most perfect 600 year old castles you will ever find. One of the hairiest (scariest) roads in Crete used to be the road down to Hora Sfakion until they did it up and toned it down. But now there is another, a recently tarmaced dirt road that leads from Kallikratis to Frangokastello. Kallikratis is a bit remote in the mountains above Argiropouli, but now, thanks I suspect to EU help, it is beginning to enter the real world. Recently, about two weeks ago, I drove down this road in our little car with my wife, and she agrees, scary it certainly is. Anyway here is a lovely video by Dave Wood on Youtube of this exact road. K is a wonderful letter for anyone who lives in Crete. 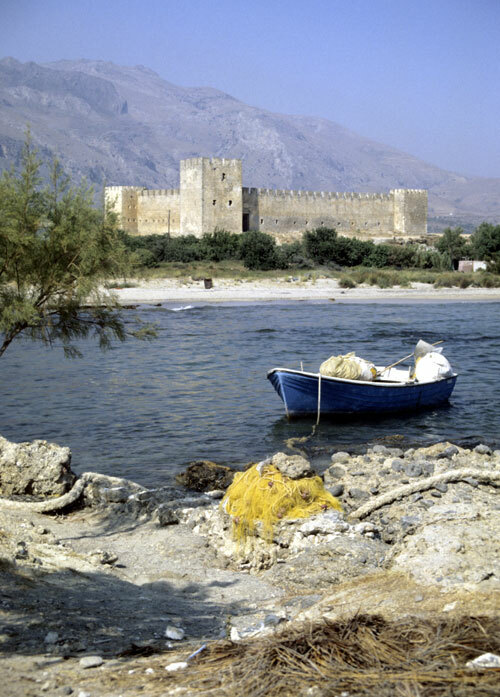 In Greek the word for Crete is Kphth (pronounced Kriti). There are so many places that begin with the Greek letter Kappa or K that it is unbelievable. But for me one of the most memorable things about Crete, and of course the rest of Greece, is the kaiki. The kaiki is a small boat made of wood that is used in the Ionian, the Aegean and Cretan seas mostly for fishing, but of course today they can be used for trips or whatever. Here is a photograph of the small fishing port in Rethymno and you can see all the kaikis waiting for the hour when the best fishing begins. But kaikis are all over the island, wherever there is a port. Large ones and small ones. Some go out every day just to get a catch that will satisfy the taverna owners, others land a catch that will end up in a market such as Iraklion or Hania. 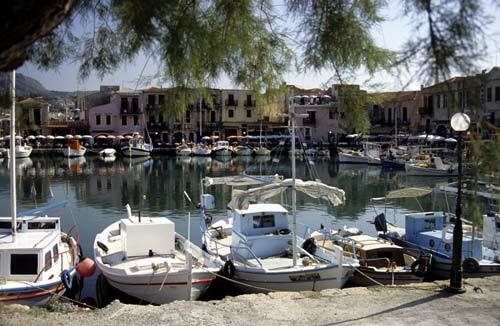 Some places on the south coast of Crete have very small harbours. Here is a photograph that I took in the south of Hania province in a tiny village called Frangokastello. 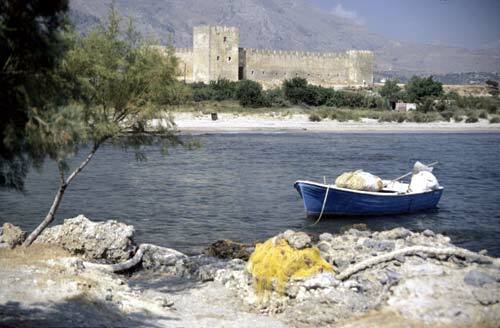 Frangokastello means Frankish Castle, actually built by the Venetian occupiers of Crete from the 13th to the 17th century when the entire island of Crete was renamed Candia for the period. This castle was built to deal with the south western Cretans, the Sfakians, who never accepted the rule of anyone other than themselves. Yet here in Frangokastello, set by the sea a long way from the high mountain bases of the Sfakians, the Venetians found themselves ignored. The Sfakians continued their turbulent behaviour conveniently bypassing the castle with it’s small troop of Venetian soldiers. It must have been a nice place to spend your time, even in those days. Who owns the kaiki in the photograph? It is the splendid taverna, right here on the sea front of this exquisite beach.